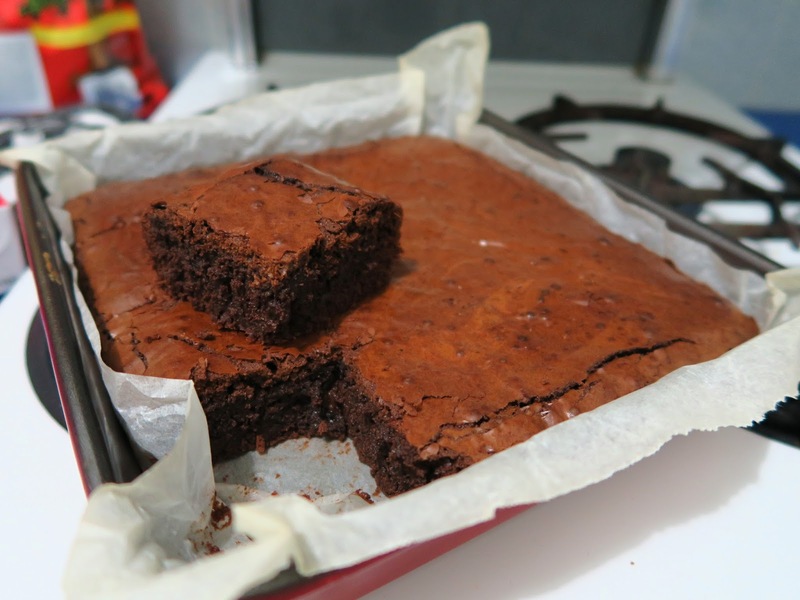 New York Cult Recipes - Brownies. For the past few weeks every-time I came across a post about brownies I went green with envy. It wasn't fair that their little squares of chocolatey goodness aka brownies were at arms length while my brownies were still in the form of chocolate, sugar and eggs. I had to fix this. So I made brownies and they were delicious! I had thought about using one of the many recipes online that I kept coming across but thought why not add another one to the mix? I got this recipe from the cookbook 'New York Cult recipes' by Marc Grossman. I love this book and want to make nearly everything in it although I will admit this is the only recipe I have made from it yet. Back to the brownies... these are a gooden. 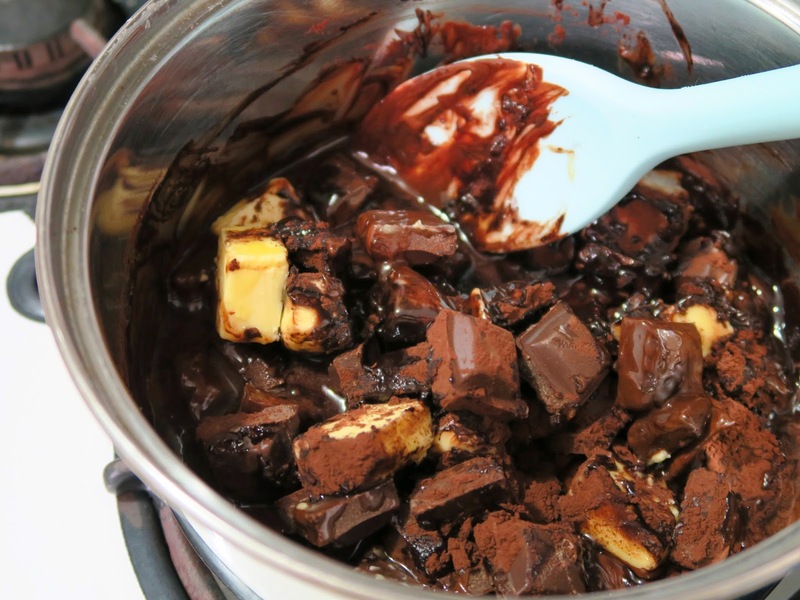 Not overly sweet, but deliciously rich & fudge-like, easy to make (melt + mix = winner! ), go great with a cup of hot coffee, are incredible warmed up with vanilla ice cream and best of all... I got to actually eat them and not just drool all over my keyboard. Here are some of what I have drooled over... Click at your own risk. Gerhard Jenne's Bittersweet Brownies with Cranberries posted by Luisa from The Wednesday Chef, Ashley Rodriguez's Bittersweet Brownies with Salted Peanut Butter Frosting also posted by Luisa from The Wednesday Chef, Dark, fudgy, muscovado brownies posted by Amelia on Bon Appetempt, Brownie Cookies with peanut butter frosting by Donna Hay and The 'I want chocolate cake' cake by Smitten Kitchen. Or there are these ones you can make... they are well worth the 35 minutes wait for them to cook in the oven. 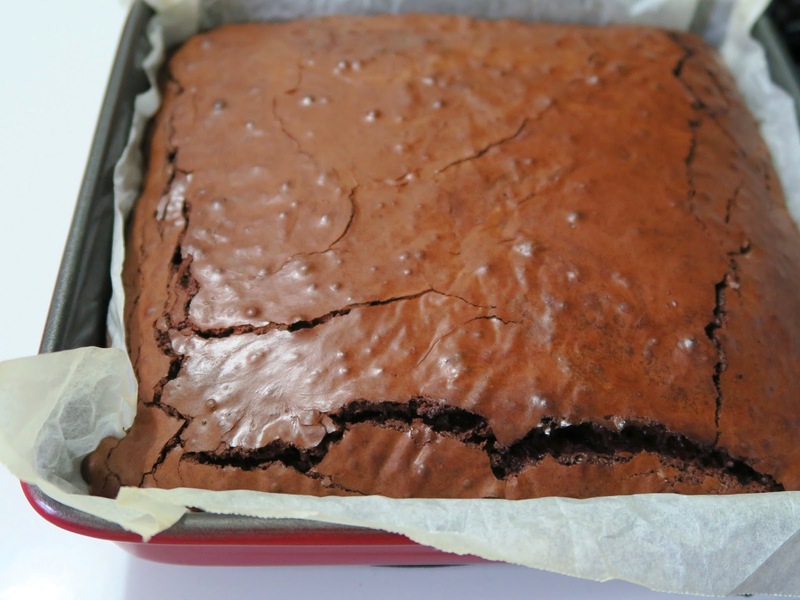 Brownies from New York Cult recipes. - Preheat the oven 180C (350F). 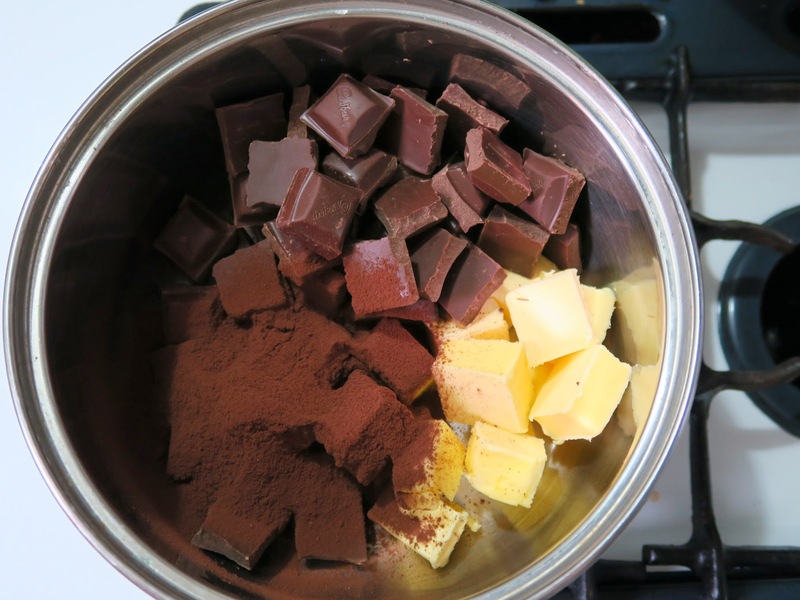 - Melt the butter, chocolate and cocoa powder in a saucepan over low heat. - In a large bowl whisk together the oil, vanilla, eggs and yolks vigorously for a few minutes. Trust me - It's well worth this little bit of arm muscle work out. 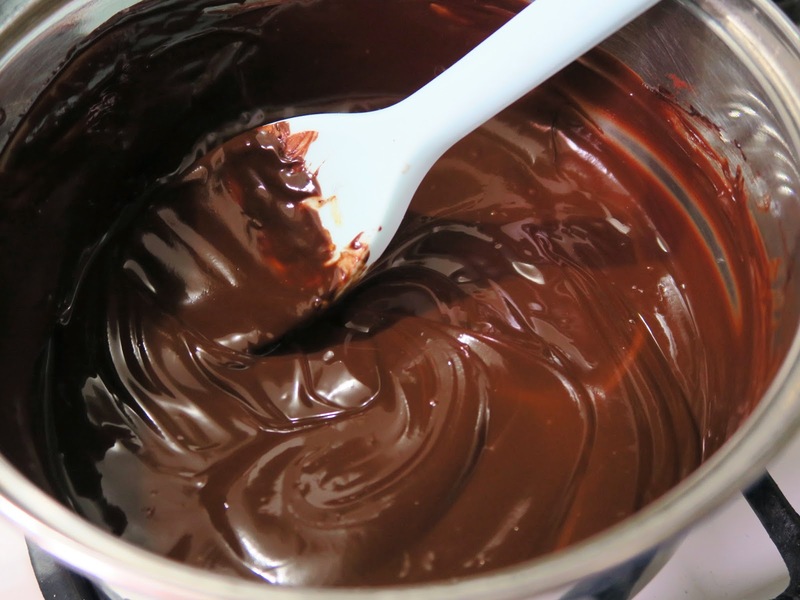 - Combine the dry ingredients and add them to the egg mixture, then stir in the melted chocolate mixture. - Line a square cake tin with silicon/grease proof paper. - Pour the batter into the lined tin. - Bake for about 35 minutes. The top should look shiny and a little cracked but fairly solid in the centre to the touch. - Try not to burn your mouth as you dive into hot decadent brownie. Best eaten warm so leave it for a about 1 hour then dig in. Spaghetti with zucchini, chilli flakes and lemon juice. It definitely didn't help when I thought I'd make myself a proper breakfast on Saturday and failed at boiling an egg. Yes you read that right. I can't boil an egg... according to my attempts on Saturday. I was excited that my want for cooking was on the return and the thought of a soft boiled egg on a freshly toasted english muffin got me excited! This soon turned into a feeling of failure when I cracked the top off my (what I thought was perfectly boiled) egg and scooped out my running yoke to only watch as a mostly raw egg plopped out and pooled around my nicely buttered english muffin. It's mostly cooked...it's mostly cooked....so I tried to tell myself. But the texture of slimy raw egg that had made my english muffin soggy was too much for me to get over and my breakfast ended up in the bin. 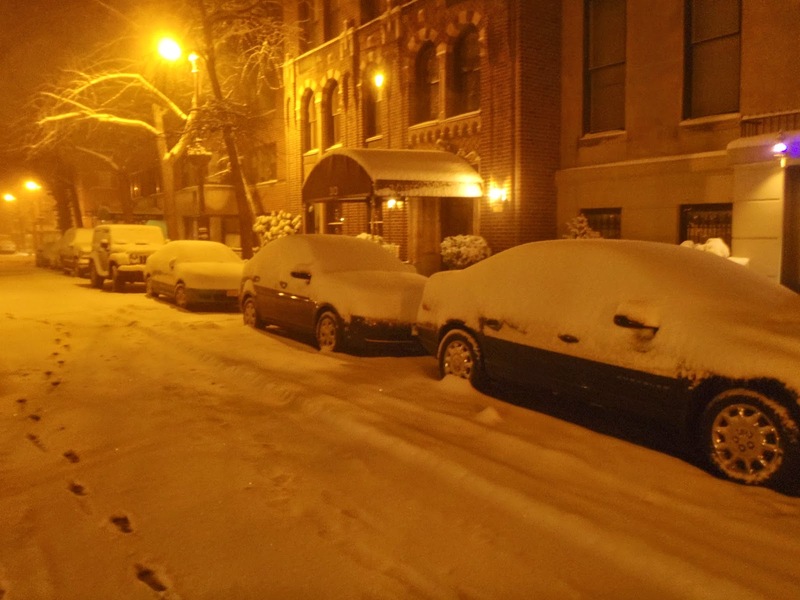 I gave up and cleaned my teeth and left the house feeling like a failure. How can I have a cooking blog when I can't even boil an egg. On a more positive note though, I can boil pasta. Hooray for pasta! Think positive. Think positive. Think positive. One night last week when I was home alone and trying to think of something kinda healthy-ish to eat for dinner and required the least amount of dishes to wash up I came up with this. Spaghetti with grated zucchini, chilli flakes and lemon juice. It was quick, fresh and full of flavour...perfect midweek meal even if you feel like a cooking failure you can do this. You don't need to cook the sauce for a start which means there is already one less pot to clean so we are already winning! I also discovered a little trick... if you pop two small (peeled) garlic cloves into the boiling water the same time as your pasta they go soft and mild and mushy and yum. While thats all cooking grate 2 small zucchini's on a box grater, juice of half a juicy lemon, a generous pinch of chilli flakes, some chopped herbs if you have them in the fridge (parsley or basil) but if you don't do not stress and wait until your pasta is ready. Fishing out the garlic cloves is the hardest part of this whole dinner. I suggest fishing them out before you drain the pasta because they seem to float but once you've drained the pasta they get lost in all the strands of spaghetti. Once you've finished fishing, squash the garlic cloves with the back of a fork and add everything back into the pot you cooked the pasta in, add a splash of extra virgin olive oil, a nob of butter, a good seasoning of salt and freshly ground black pepper and finish with some parmesan cheese. - Throw your spaghetti and peeled garlic cloves into a pot of boiling salted water and cook according to packet instructions or until pasta is al dente. - Meanwhile grate your zucchini using a box grater (or any grater you have) and get all your other ingredients ready to go. - Fish out your garlic cloves just before you drain your pasta then place the drained pasta back in the pot with a good splash of extra virgin olive oil and a nob of butter. Squash the garlic cloves using the back of a fork until they are a paste then add them along with the chilli flakes, lemon juice and herbs (if using) to the pot with the pasta. - Turn the heat on low for about 2-3 minutes just so the zucchini warms through a little bit more. - Season with salt and pepper and serve with parmesan cheese sprinkled on top... either in a bowl or eat directly from the pot. 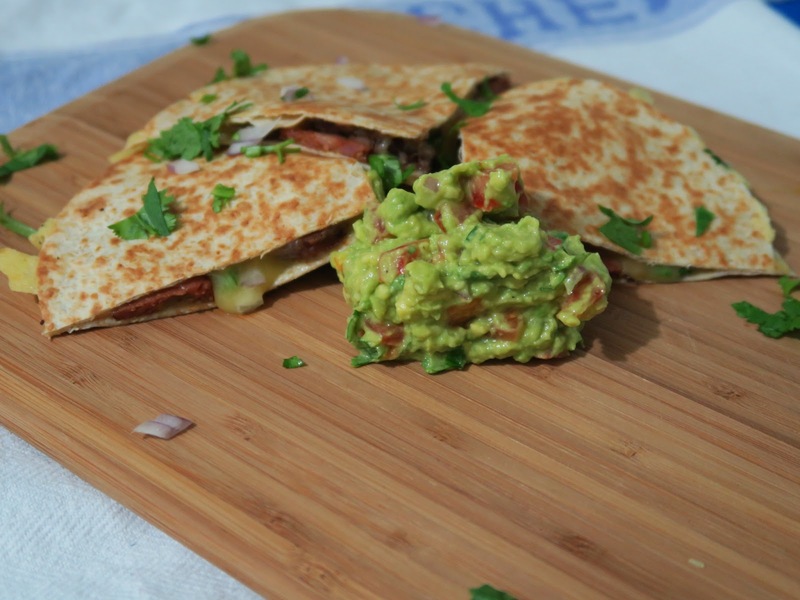 Chipotle & black-bean quesadillas with guacamole. The past week or so I have been craving Mexican food. It's all I want to eat... it's probably a good thing that there is no good Mexican take-away shops around me because otherwise I'd probably be a take-out junkie. But I also don't own any Mexican cookbooks so off to Bookdepository I went. But of course delivery takes time and I'm impatient but I was prepared ingredient wise. I had ordered some dried Mexican chilli's when I ordered my porcini mushrooms for my previous post, so now I had chilli's but no recipe. I was in luck when this particular recipe popped up in my instagram feed last week. 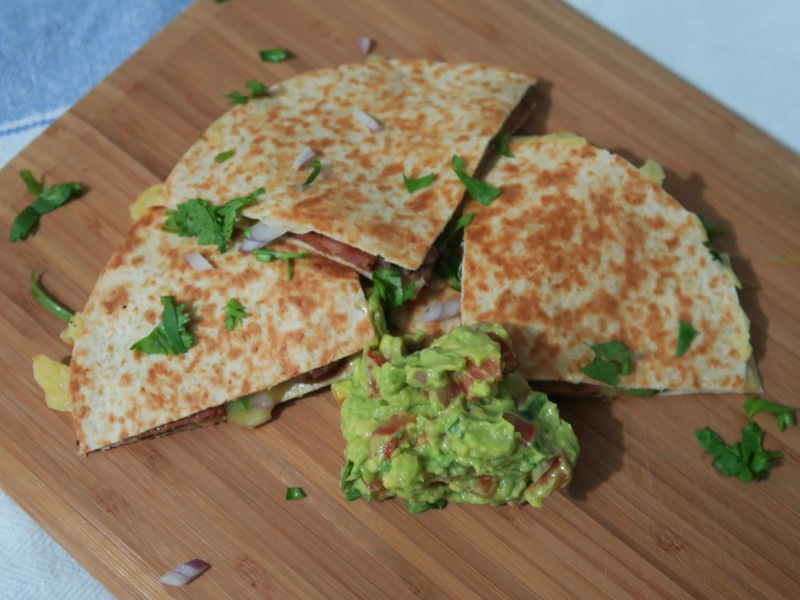 Chipotle Black Bean and Avocado Quesadillas by Naturally Ella. 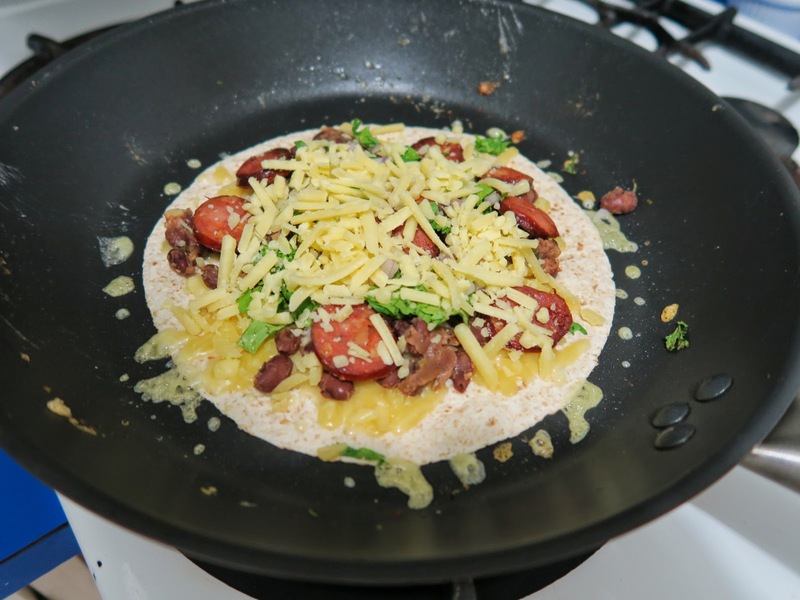 I'd never made quesadillas before so I was interested already and I love black beans and I LOVE avocado and it just so happened that I had some dried chipotle chilli's in my cupboard too. Now I know chipotle chilli's aren't a store cupboard staple in most kitchens but this recipe would still work well with a sprinkle of cayenne pepper for kick, it just wouldn't have the smokiness the chipotle chilli's give. (I bought mine from Essential Ingredient online). I changed the recipe slightly because I'm not the biggest fan of warm avocado so instead of putting it inside I made a simple guacamole and spooned it on top. This is definitely a quick midweek meal that felt a little special because it's not normally what I cook during the week but I'd do it again in a flash. The best thing is you can add what ever you want in the centre mix depending on what you have or feel like. I added some smoked chorizo sausages to Tristan's quesadillas because I know he would straight away ask me where the meat was. First I made the black bean mix buy putting everything in a pan and cooking it until the liquid had absorbed. I then fried the chorizo in a pan till the edges were crispy. Made the guacamole. Then I was pretty much ready to go and get making. They reminded me of making a toasted sandwich in a frying pan which is what I have resorted to since not having a toastie machine. This scared me a little because I have a fantastic habit of burning sandwiches in frying pans till they are as black as the teflon base. So this had me a little anxious to start with but it wasn't going to turn me away. Low and slow baby... all the way... that's the trick. If you're craving Mexican food, don't touch the take-away menu actually go and throw it in the bin now. Make this super tasty, fresh recipe instead. Its quick, full of flavour and would make a great appetiser for a movie night in with friends or midweek meal like I had it. This was a really fun dinner to make too and it hasn't kicked my Mexican cravings... if anything it's fuelled them for more! 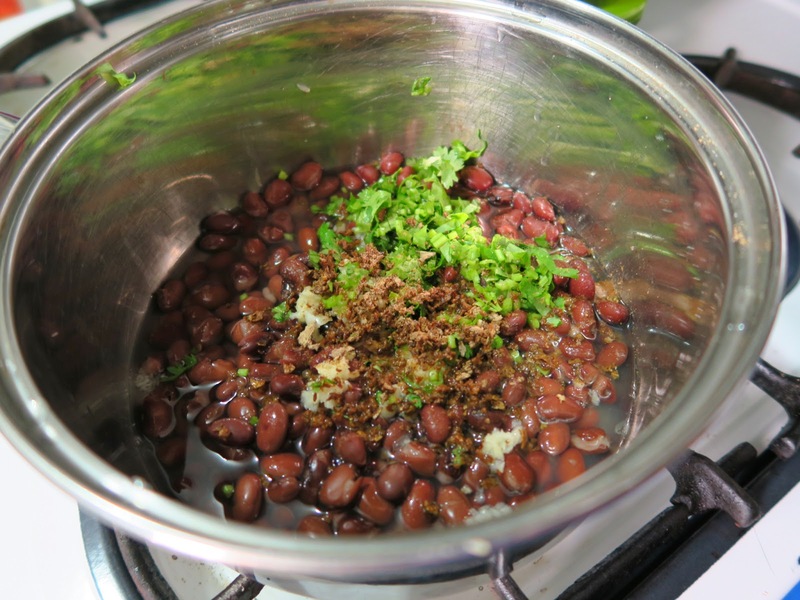 - Start my placing the black-beans, garlic, chipotle chilli, salt, lime juice and coriander stalks in a pot with 1/2 cup water. Bring to a boil and simmer until most of the liquid has gone. - Next make your guacamole by mixing everything together in small bowl. Refrigerate until needed. - If you have someone who complains about no meat then fry your chorizo sausage on medium heat now, until crispy around the edges. 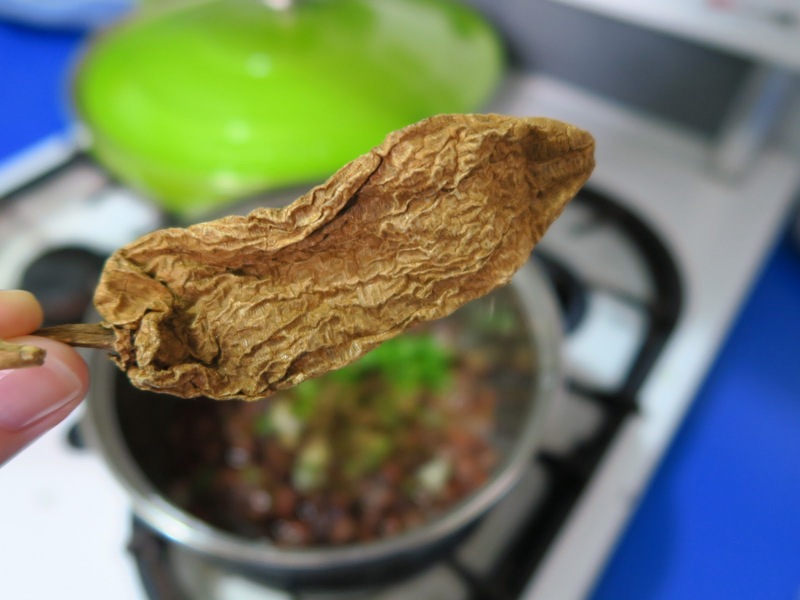 - Get a non stick frying pan that will fit your tortillas in comfortably on low heat. 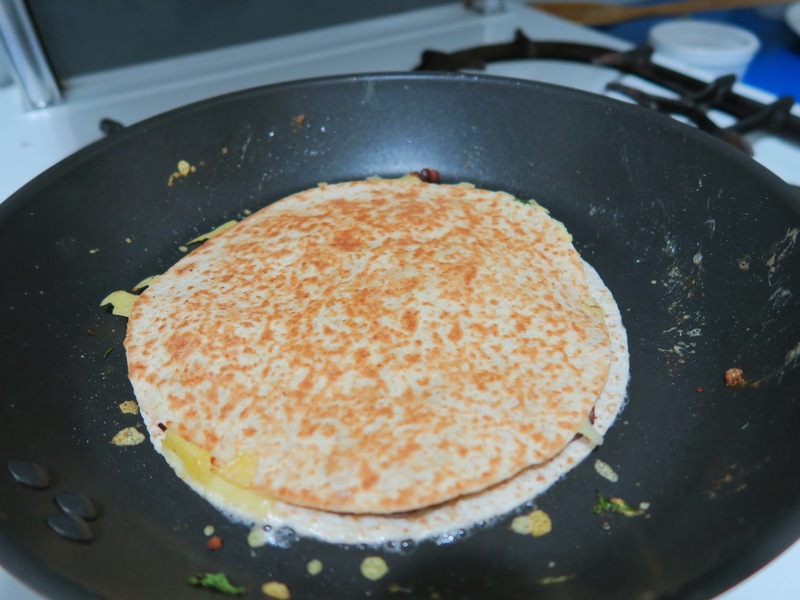 Brush one side of a tortilla with the oil and place it oil-side down in the pan. 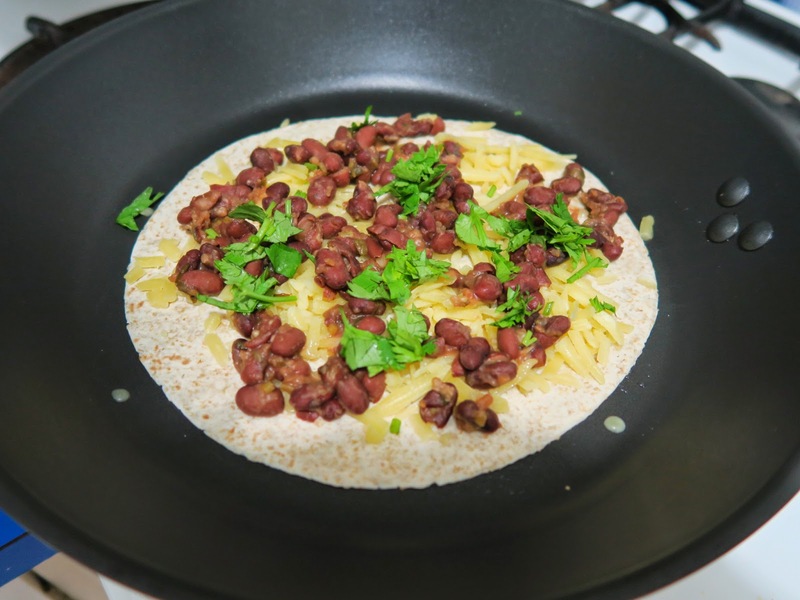 Sprinkle 1/4 cup of cheese on the tortilla, followed by 1/3 of the black-beans, (1/3 of your chorizo sausage if using), a sprinkling of coriander leaves then another 1/4 cup of cheese. On a clean surface brush another tortilla with oil on one side and place that on top of all the ingredients in the pan, oil-side up. Give it a little push down and be patient. - This should take about 3 minutes a side. 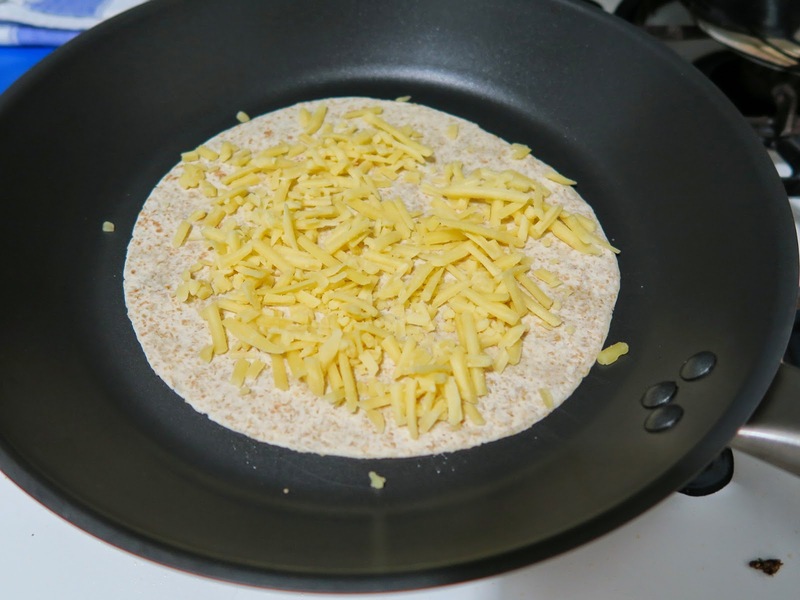 Once your confident that the cheese has stuck the top down, hold your breath and give it a confidence filled flip. Push any filling back inside if it has fallen out and cook for another 3 minutes on that side. They should be a golden colour on each side and the cheese should be melted. - Repeat this until all your ingredients and tortillas have been used up, cut into wedges and serve with guacamole. ** I got my dried chipotle chilli's from Essential Ingredient online.